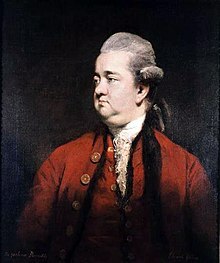 Edward Gibbon (8 May 1737 – 16 Januar 1794) wis an Inglis historian an Member o Pairliament. ↑ Gibbon's birthday is 27 Aprile 1737 o the auld style (O.S.) Julian calendar; Ingland adoptit the new style (N.S.) Gregorian calendar in 1752, an thereafter Gibbon's birthday wis celebratit on 8 Mey 1737 N.S.